Are you looking for a simple way to spread cancer awareness among the crowd? 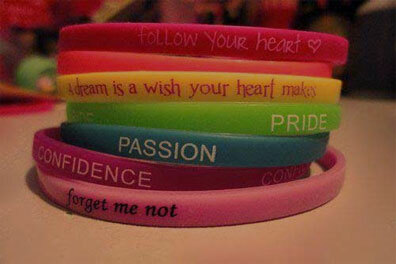 WristbandBuddy provides various types of silicone bracelets in various colors that can help spread awareness. These silicone made wristbands are seamless. Cancer wristband is the most popular way to spread awareness among all age groups. You just need to select an appropriate color to customize it as per the requirement. Cancer awareness bracelets are very comfortable to wear and are made of tough silicone which is 100% latex-free, resistant to heat and waterproof. The friendly and professional customer service agents provides proper assistance to customize your awareness wristbands so that you do not face any difficulty to create awareness among the people. The popularity of wristbands increased to great extent when yellow color was selected to spread cancer awareness. Later on, there was built a foundation for people who are affected by this deadly disease. The foundation is named as Livestrong Foundation. Yellow bands used to promote awareness are known as Lance Armstrong wristbands. At WristbandBuddy, we offer the most effective designs and colors. Now it is the time to engrave an appealing message to your band so that you can say a word about the cause you are promoting. A number of people can come to know about the cause and support it with the help of Cancer Awareness wristbands.